Sonda Ann Locklear, age 39, of Vass, passed away on Saturday, June 2, 2018. A Celebration of Life will be held on Wednesday, June 6, 2018 at 6:00 p.m. at Cox Memorial Funeral Home Chapel with Rev. Jonathan Scarboro and Rev. Dennis Patterson officiating. The family will receive friends immediately following the service at the funeral home and other times at the home of her mother, Susan Locklear, 410 Sanborn St, Aberdeen,N.C. Sonda was born in Pinehurst, North Carolina on March 3,1979 to Susan Campbell Locklear and Jeroby Locklear. No life is ever complete without friends that have endeared and enriched our lives along the way, and such is the case with Sonda Locklear. She touched many lives in some small way throughout her short, yet very memorable life. She was a loving mother, daughter, sister, aunt, grandmother and friend and will be greatly missed by all who knew and loved her. She is survived by her children, Corde’ Locklear of Charlotte, Christopher Locklear of Pinebluff and Tiahja Locklear of Aberdeen; mother, Susan Locklear of Aberdeen; father, Jeroby Locklear; grandmother, Margaret Campbell; sister, Regina Sheffield of Aberdeen; grandson, Dakota Locklear and a host of aunts, uncles, nieces and nephews. She was preceded in death by her grandfather, Clyde Campbell, Jr. 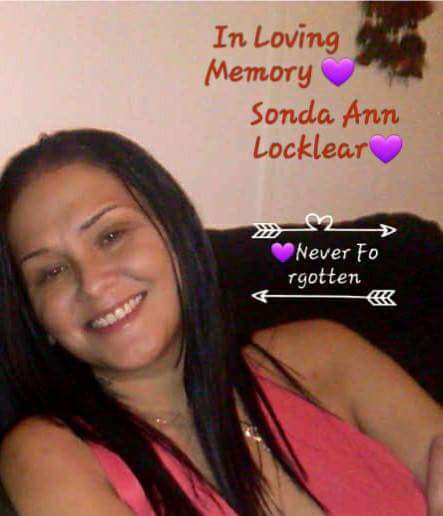 The family request no flowers, donations may be made to Sonda Locklear Memorial Fund, c/o Cox Memorial Funeral Home, PO Box 651, Vass, N C 28394.